This is the first flower from a new cross now in bloom. A cream colored N. romieuxii was crossed with pollen from a 7G-G seedling. Normally the 7G-G flowers in November, but N. romieuxii always flowers later in the winter. This seedling is autumn flowering, as will several other siblings yet to open. I was hoping for a green bulbocodium. 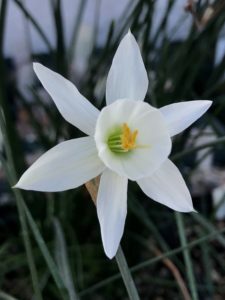 This new flower is crystal white but with perianth of great flat form. The corona has been shortened but is still obviously a bulbocodium. There are other similar crosses still to flower this season, and hopefully at least one will also be green.